Welcome to Brookfield Hills Golf Course - the word "quality" is used to describe this challenging 18 hole course. Owned and operated by the Storm family, this 4,926-yd. par-62 tract has for several decades provided 18 holes of stimulating golf for anyone looking for league play, a round of golf after work, or an opportunity to host a golf outing. Brookfield Hills is an executive golf course that is manicured to country club standards. Its watered fairways, large greens and long tee boxes give players of all levels an enjoyable round of golf. Best of all, it's open to the public. One of our greatest assests is... location! This easy to reach facility touches the east bound lanes of I-94 and the west edge of Moorland Road just 15 minutes west of downtown Milwaukee. The front nine, par 32, makes you forget you are in a busy southeastern suburb of Wisconsin. 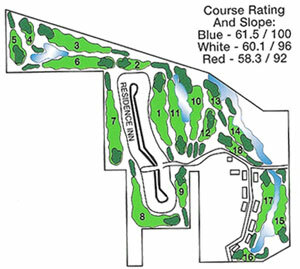 Fairly wooded, the front nine is the favorite of the two nines because of the lengthy par 4's. A popular hole on the front nine is No 8. Par 4, 425 yards dog leg to left.... it holds a challenge for every golfer. A well hit and carefully placed tee shot over the trees will leave you with a wedge or nine iron to the green. Not sure you can make it over the trees to the left, hit your tee shot straight and it will leave you with 150 - yards to the green. The back nine, par 30, makes you sharpen up your short game skills. However, six of the holes have a looming presence of water. The favorite hole on the back nine is No. 16. The 135-yd. par-3 is a strong blend of water, sand and rolling putting surface. Players must place their tee shot over the river to reach the green. Careful of the greenside sand bunker which obscures a good portion of the green.